Abu Dhabi National Oil Company (ADNOC) on Saturday awarded a 10 per cent interest in its offshore Lower Zakum concession to a consortium of Indian oil companies. The concession is one of three that will replace the ADMA offshore concession when it expires on March 8. The other two are Umm Shaif and Nasr and Sateh Al Razboot and Umm Lulu. ADNOC said it was the first time Indian oil and gas companies had been given a stake in Abu Dhabi’s hydrocarbon resources. The consortium of ONGC Videsh, Indian Oil Corporation and Bharat PetroResources contributed Dhs2.2bn ($600m) to enter the concession, which will be operated on its behalf by ADNOC Offshore. The deal will begin on March 9 and span 40 years. “The offshore concession in favour of the Indian consortium has taken our bilateral engagement in the oil and gas sector to a new level, which befits the comprehensive strategic partnership between our two countries,” said Indian Prime Minister Narendra Modi, who is in the UAE this week for a state visit. 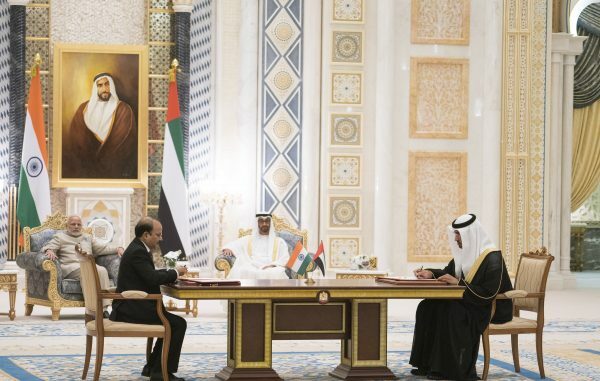 ADNOC also signed agreements with Indian Strategic Petroleum Reserves Ltd to build a strategic crude oil facility in the southern Indian city of Mangalore. The partnership, which builds on a previous deal signed in January 2017, covers the storage of 5.86 million barrels of oil in the underground facilities at Karnataka. The International Energy Agency (IEA) forecasts Indian energy demand will grow to more than five times its current size by 2040 as India becomes the world’s most populous country. For now, India is 79 per cent dependent on crude imports to meet its oil needs, of which 8 per cent is supplied by the UAE. “This agreement demonstrates the confidence of the international market in ADNOC’s long term production targets and ADNOC’s strategy to maximise economic value and recovery from its offshore oil and gas resources. This is an attractive and strategic agreement for both parties that will deliver competitive returns and long term growth opportunities,” said ADNOC group CEO Dr Sultan Ahmed Al Jaber. ADNOC said it is finalising potential foreign partners for the remaining 30 per cent of the available 40 per cent stake in the Lower Zakum concession. The company plans to raise its oil production capacity to 3.5 million barrels a day this year.